Last year, an EarthBound hacker by the name of H.S. 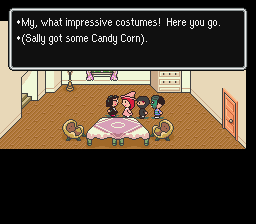 released a high-quality Halloween-themed EarthBound hack called Hallow’s End. You might know H.S. 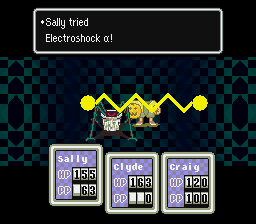 from some of the recent work on the EarthBound Zero remake revival hack, so you know it’s some quality stuff! As you can see, the hack even has a sort of Costume Quest vibe to it at parts, even though I think the hack actually predates Costume Quest. Haha that really does look interesting! Verry nicely put together. I should play me these hacks, methinks. And a main developer of Costume Quest claimed it had an Earthbound infulence. Was it actually released last year? I thought that’s when it started, but I don’t remember anymore. Phenomenal hack, I just couldn’t get very far in it. Those little blonde witch girl sprites are the best part. I guess the rest is okay, too. YOU GUY’S HAVE TO PLAY THIS HACK IT IS BY FAR THE BEST EARTHBOUND HACK YET!!!! I beat it a week ago! The first thing I thought when I saw it was ‘It’s the Great Pumpkin, Charlie Brown’ one of my fave Halloween cartoons. I’ll have to play it! So far, it’s pretty interesting. My one and only complaint is that some of the areas are so large and complex I miss the map. But considering I’m not even sure if hacking the map is possible, and even if it was, it’d probably be a lot more work than it’s worth, I suppose I can over look it for being too awesome. Well, it does get a bit grindy too, but I’ve played through much worse, and everything else about this hack is so incredibly well done. can’t seem to get through the Cursed Woods. Everytime I get thrown back to where I found the Bag of Fruits for Craig. Yeah, hacking the town map isn’t really feasible. But I do understand what you mean about some areas being large and complex. I put maps of some of the larger areas into the map pack that’s available in the first post, so hopefully that will help some. I included a map of the Cursed Woods in the map pack available in the first post, so you can check that if you need help. Thanks H.S! Got thru it now! All and all, it was an impressive hack. Particularly the actual hacking aspects of it. Balance wise, I’d say it could have used a little more polish. I realise it was supposed to be a difficult game, but there were certain things i just didn’t enjoy. Money is a big problem, because the enemies just don’t drop enough of it. Later in the game I had to grind for hours just to be able to afford the next set of equipment, which would quickly become outdated. And you can just forget stocking up on healing items. Even affording a hotel was a hardship if you had a bad battle. I’d say if you were ever going to retouch the hack, I’d suggest at least doubling the money you get from battles, if not tripling it latter in the game, because it got sooo tedious I was tempted to quit. Same thing with the bosses. Too much HP. Generally, they weren’t that hard. They just took forever to kill. The last few were actually pretty borring. Sure they could kill you in a turn or two. Sure, they were cheap as all heck. So you’d heal, and chip away at them for what seemed like an hour. Rinse and repeat. And if you lost near the end you had to do it all over again. I’d suggest toning that down, even if it makes the game a little easier. It’s just not fun to do the same thing for that long and hope you don’t suddenly get unlucky or run out of supplies. Even some later regular enemies seemed to drag battles out. But to end on a positive note, the game is HUGE, the map editting is some of the most impressive I’ve ever seen. 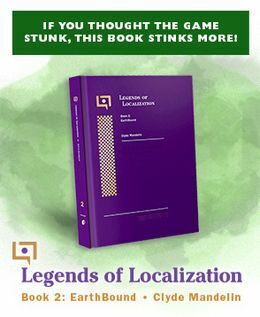 The amount of original text is simply amazing, with plenty of humor and quality writing. The level new design is creative, and the stuff reused and reinvented from Earthbound is also done creatively. It’s not perfect, but it’s definately worth taking a look at. You can really tell a huge amount of work went into it. 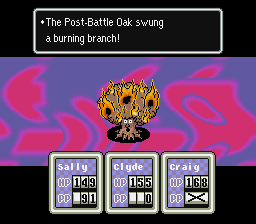 Cool, somebody should make an Earthbound Bleach hack like this one. Can someone post step-by-step instructions for how to apply this patch using a Mac-OS setup? Thank you. I cannot beat the FINAL boss for the life of me – I’ve tried like 15 times – tips? Personally, I didn’t enjoy the hack very well. At first, when I just started, I was stuck for a while. I could not find the house I missed. The ammounts of grinding and wandering around, not knowing what-to-do, ruin the experience the most for me, and thats why I stopped playing it .-. Not sure if anyone is still looking at these posts, but if anyone can help I would greatly appreciate it…I have been playing this hack for a while off and on and I am loveing it! My problem is that I am now stuck. Not in a game type stuck, but literally stuck. The game keeps freezing up on me. It happens every single time I get close to the entrance of the palace (I’m assuming it’s a palace since it was in EB.) I have made it all the way through the caves where sprites aren’t allowed, and every time I get close to the next door it freezes up. I even tried going back through the caves and “leaving” to end up back outside the Mersetti Building, at which point the game freezes up if I go anywhere near the park in the middle of town. I am really novice in the ways of emulation, so maybe there is an easy fix that someone knows about? Once again, ANY help will be greatly appreciated!!! I really want to finish this game since I have spent so much time in it (even with the map download the woods got me for HOURS!!!) Thank you in advance to anyone who can help. 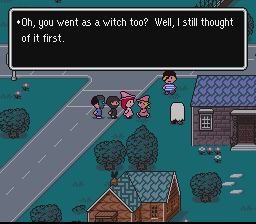 Yeah, the problem with hacking a rather unstable game like EarthBound is that little errors like this crop up for no apparent reason. Sadly, I don’t know of any easy fix for something like this. A general thing to try is to download a fresh rom, apply the patch with the included patcher, and rename your save files you so they’re the same as the new rom. But in the event that that doesn’t work, I don’t know what else can be done. Sorry. I’ve read a lot about how difficult the hacking process is, that’s why I love playing these so much, seeing how much time you guys and gals put into these just makes them all that much better. I might try to start over, we’ll see what the future holds. Thank you for getting back to me, like I said I don’t know jack about this stuff other than how to download and read directions on how to patch, I had some freezing up earlier in the game but was somehow able to work around that, not so much this time. Oh well, if I don’t get to replaying it, it was an amazing ride while it lasted! Thank you for all your hard work and dedication, it’s been a while since a game has been so frutstrating, yet so satisfying at the same time!